Home /Coding, Tech, Software/The wsappx process. What is it? Why is running on my pc? When Windows 8 was released, Microsoft included the Windows Store (now Microsoft Store) within, offering a way to buy or download apps in one single place. This leads to the Microsoft Store that you can see in Windows 10 and a couple more of system. 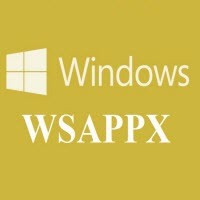 This Store bring certain new processes to the core system of Windows, and wsappx is one of those. Here is everything you need to know about the wsappx process. This is a Windows process related to the Windows Store or Microsoft Store. It is part of the normal functioning of Windows 8 and Windows 10 and it’s a safe process to have running. This process at the same time uses 2 different process. In Windows 8 you can see the AppX Deployment Service or AppXSVC and the Windows Store Service, WSService. In Windows 10 you can find the Client License Service, ClipSVC and the AppX Deployment Service or AppXSVC that also comes with Windows 8. These 2 process are part of the wsappx and run simultaneously. You can check this in the Processes tab located in the Windows Task Manager. Justo search for wsappx and click it, it will expand and show you the AppXSVC and, depending of the Windows version that you have, you can see the WSService or the ClipSVC. Both processes are in charge to perform various task related to the Windows Store, like the installation, download and update of the Store apps. It is also the way Microsoft uses to verify if your Store apps are properly licensed. The AppX Deployment Service, or AppXSVC. What is it? This is the process that comes with both Windows 8 and Windows 10 wsappx. This process handles everything related to the installation, removal and update of all of the Microsoft Store apps. You can start this process if you install or uninstall any Store app, and it starts automatically when Microsoft updates the apps. If you open the Windows Task Manager and see the AppXSVC service running or using CPU resources, it may be updating some apps in the background. ClipSVC or Client License Service. What is it? This is the Windows 10-specific process that comes with the Microsoft Store. The ClipSVC runs in the background and is in charge of the good functioning of the Store, offering the support that it needs to run properly. There is not a lot of information about this service besides the one that Microsoft releases, but this process is known to handle a couple of task required by the store, like the anti-piracy feature, where this process look at your software license to see if its original or not. Windows Store Service or WSService. What is it? This is the Windows 8 version of the ClipSVC, if you read the service description in the Services windows, it says “Provides infrastructure support for Windows Store”, the same dialog that appears in the Windows 10 version of it. The WSServices and the ClipSVC fulfill the same role: anti-piracy system, Store support and some other necessary task required by the Microsoft Store. Why the xsappx is using so much CPU resources? Click on your user icon, located at the top right corner. By doing this, you disable the automatic updates and if you want to update your apps, you will need to do it manually. This prevents the xsappx process from running automatically in the background, consuming resources. However, if you updates your apps, the xsappx will launch and begin its process. Can I disable the xsappx process? No, you can’t disable it. If you try to, you will receive a warning dialog windows that says “Ending this process will cause Windows to become unusable or shut down”, so isn’t recommended to do it. Also, this process will close automatically when the updates or the installation are finished. Is the xsappx a virus? No, this process is part of Windows and there are no reports of any virus using the xsappx as a disguise to do its work. This process come with both Windows 8 and Windows 10 as a part of the Microsoft Store. If you Pc is slower than usual or it’s using a lot of resources without you running programs, you can always run an antivirus scan to make sure everything is in order.